This rugged temperature probe features a wide temperature range, from –20 to 330°C. The high upper limit of the sensor allows for melting point determinations of most organic compounds. It uses RTD (Resistance Temperature Detection) technology to establish a ±0.5°C accuracy, as well as excellent stability and repeatability. Each unit is individually calibrated, and the calibration is stored on the sensor. It is designed to be used as you would use a thermometer for experiments in organic and inorganic chemistry, physics, biology, Earth science, and environmental science. The Wide-Range Temperature Probe may require a compatible interface and software. Choose a platform below to see compatible interface and software options. The Wide-Range Temperature Probe is fully supported with LabQuest 2 (version 2.8.5), a standalone data logger with built-in graphing and analysis software. The Wide-Range Temperature Probe will never need to be calibrated. Each probe is carefully calibrated before it ships, and this unique calibration is stored on the sensor. Note: There is no method to perform a calibration of this sensor in most of our software programs; however, there is no need to do so. Logger Pro does allow for an approximate calibration, but the results would likely be less accurate than the custom factory calibration. where T is temperature (°C), K0 = ~ –33.8, K1 = ~73.2, and K2 = ~0.90. During the Vernier custom calibration, these values are adjusted slightly to achieve a ±0.3°C accuracy value at 100°C. The data acquisition programs convert V to temperature in units of °C (default), K, or °F. 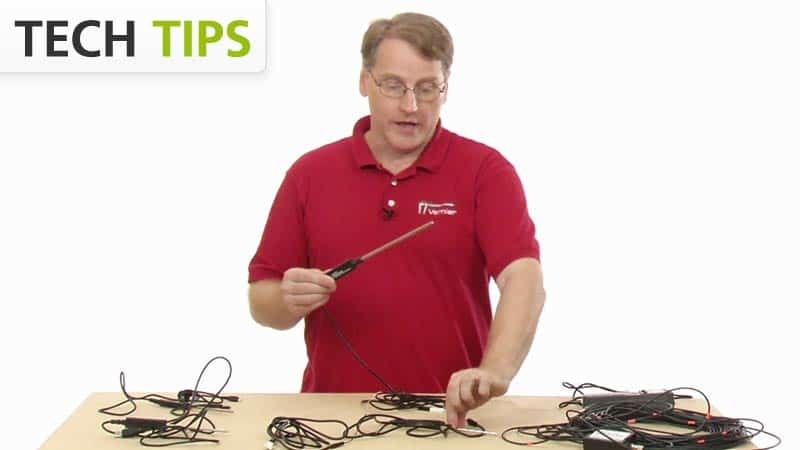 If you have watched the related product video(s), followed the troubleshooting steps, and are still having trouble with your Wide-Range Temperature Probe, contact Vernier Technical Support at support@vernier.com or call 888-837-6437. Support specialists will work with you to determine if the unit needs to be sent in for repair. At that time, a Return Merchandise Authorization (RMA) number will be issued and instructions will be communicated on how to return the unit for repair.